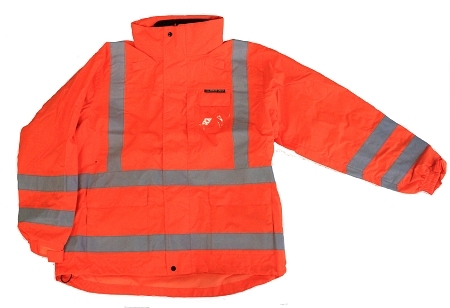 ANSI Class 3 Fluorescent orange waterproof safety jacket. Waterproof windbreaker shell with waterproof seams. Removable, zipper-out, black fleece lining with knit wrists. Long sleeves. Knit wrist. 2 inside pockets on fleece liner. Two outside pockets. One badge pocket with closure. One sideways zippered chest pocket. 2 badge tabs. Storm front with zipper and snaps. Detachable hood, stored under collar. 2” wide horizontal and vertical SILVER reflective stripes on front and back and on sleeves, with "X" stripe on back, as required by many railway operations.